This article has been generously contributed by Simple Survival for your reading pleasure. A few years ago, when I had first entered the military, I had the chance to read a copy of a survival journal written by a man that was discovered dead. The rescue team had brought out all of his gear, and then turned the journal over to the Air Force. The Air Force had copied the journal and distributed it to various sections to assist in survival training. There were many lessons to be learned from the dead man’s situation. The key to his death, or seemed to me anyway, was nutrition. Most of us know little about nutrition, because many of are not very interested in the subject to start with. Generally, we have nutritious meals (or at least they are available), we take multi-vitamins, and we (as a country) may be a bit over weight. But, what do we, as hunters, fishermen, campers, and backpackers, know about survival nutrition? I suggest we know (and may not even care) much about the subject. The man with the journal had died in World War II, and was not discovered until sometime in the 1950’s. His journal was not printed and distributed until the early 1970’s. While less was known about nutrition during the writer’s lifetime, there were things known that could have saved his life. However, I think, like most of us, he was neither interested nor very knowledgeable of the subject. In other words, he was typical of many outdoorsmen and women. The dead man’s aircraft had crash-landed on a frozen lake up north (Alaska perhaps). I can’t remember exactly where he went down, and it is not very important where it happened, because his situation could be relived in many states or countries. The thing to keep in mind, his crash site was remote. As I read his journal, I discovered a man with the guts and determination needed to survive. He was an experienced outdoorsman, with years of hunting behind him. He had also been trained, to a small extent, by the military. His journal showed a man of discipline, as well as a deep “will to survive.” Then, you are most likely asking, why did he die? Over the years I have done a lot of thinking about what the man had written, reliving his fear of death, as well as what the sergeant had said. I have done a little research on nutrition and while I cannot even remotely claim to be an expert, I have found some basic facts we should all keep in mind about vitamins. First, I suggest all of us carry a small container of good quality multivitamins in our survival kits. They are light and easy to carry. Keep them in the original bottle, because it protects them from sunlight, which can decrease their effectiveness, and it keeps them dry. But, what are the basic essential vitamins for us if we are in a survival situation and do not have vitamins along. Many professionals and “armchair” survival “experts” may disagree, but this is a group of vitamins I think we should be concerned about. Vitamin A, (retinol). We get this vitamin from milk products, animal fat, carrots, and leafy green vegetables. Why do we need this vitamin? It helps keep your vision working well, your immune system up and working, and assists in the functioning of most major organs. Where do you find it? From animal fats, contents of the stomach of plant eating animals, wild green plants in the field. Vitamin B complex, (B1, B2, B3, B5, and B12). All meats, green plants (vegetables), dairy products, gains and cereals (you can get them elsewhere as well, but they are not a source readily available to most survivors, i.e., brewers yeast). Why do we need this vitamin? They are needed for the nervous system, maintaining healthy skin, the cell production process, digestive process, respiration, bone marrow production, and to assist our metabolism. Where do you find it? Once again, by eating green leafy plants (try dandelions or banana leaf), the flesh of wild animals (including the stomach contents if the environment does not allow you to forage for fresh green veggies), pine nuts, walnuts, and perhaps even wild grains or rice. Vitamin C, is found in fresh fruits, vegetables. Remember that citrus fruits and tomatoes have high levels of vitamin C. Why do we need this vitamin? It helps to build healthy tissues, tendons, and assists in absorbing iron. It is essential for healthy teeth and gums as well as for healing wounds or fractures (which may be experienced by survivors). Where do you find it? If you are lucky enough to attempt survival in a jungle, then citrus fruits may not be much of a problem. One source I use in mountains or in general locations is pine needles. The needles on pine boughs can be brewed to make a rough tasting tea. While not that tasty, it does the job of providing vitamin C as well as keeping the drinker warm. Vitamin D, can be found in eggs, dairy products, and fish with fatty flesh (tuna, salmon, sardines, oysters, and others). Why do we need this vitamin? It assists in the building of bones and cartilage. Also, it is used to regulate the absorption of phosphorus and calcium in the body. Where do you find it? During your searches for food look for bird nests. While the eggs you find will not belong to a chicken, they will serve the same purpose as far as vitamin D is concerned. As far as I know, all eggs are eatable and should be eaten if available. Additionally, set fish traps, make a dip net for smaller fish and try your hand at fishing. There may not be much of a problem procuring salmon if you are along streams and rives they run on. Thousands of salmon move on our nations waterways each year. If you catch too many of them, make a drying rack and save them for future needs. Vitamin E, is in rice and green leafy vegetables. Why do we need this vitamin? 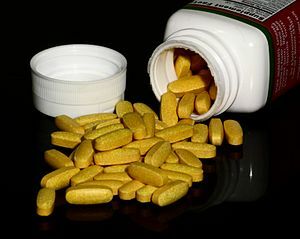 This is one of the least understood vitamins, but it is known to assist in the prevention of muscular dystrophy. So, it seems this vitamin may be associated with muscular functioning. Where do you find it? Look for wild rice. Surprisingly, it is out there. Remember, rice grows in wet locations so check long the banks of small ponds or lakes. You may get lucky and find a source. Keep in mind to constantly search for sources of food and vitamins around your survival site. Vitamin K, is produced by our intestinal tract. It can also be found in egg yolks, leafy green plants, fish liver oils, and other sources. Why do we need this vitamin? It assists in the clotting of blood. The last problem a survivor needs is the inability to clot a bleeding injury. Where do you find it? Look for eggs as we suggested earlier, search for various green leafy plants, and it need be, build up the courage to eat the contents of an animal’s stomach. The contents of the stomach can be added to soups without affecting most people very much, especially if you don’t tell them or they don’t ask. Other Considerations are carbohydrates, fats, proteins, and minerals. Carbohydrates are found in a variety of food sources. They are found in sugars, honey, fruits, roots and tubers (cook these well) as well as in cereals. Why do we need them? They are excellent sources of energy and help prevent the nausea often caused by the breakdown of body fats in the body. Where do you find it? Look for bees (honey), wild apples, cattail roots, or even wild potatoes. Cattails will most likely be the easiest to find. Fats are an excellent source of energy and are found in most animal and fish. Additionally, some plants may contain fats, as well as eggs and nuts. While some “survival experts” suggest fats can be found in fungi (mushrooms) I do not recommend eating them. They are not easy to identify by most people and overall, have very little nutrition. They have the disadvantage possibly of being poison if the survivor is unsure of its identity. Why do we need them? Fats give us our energy in a concentrated form. A key consideration here is the availability of water. Fats take water to digest, so make sure you have sufficient water when you ingest fats. Where do you find them? Animal fats are the easiest way. Keep in mind, wild game has less fat than farm animals. Also, during the winter months or early spring, wild animals may contain less fat. In the fall, after eating well all summer, wild game is usually the fatter. Proteins are found in meat, eggs, fish, nuts, and grains. While also found in dairy products, you are unlikely to find a cow in a survival situation. Why do we need them? They supply amino acids, which are necessary for good health. Where do you find them? Attempt to locate wild eggs, fish often, gather nuts and grains if possible, and eat wild meat. Minerals, minerals are need for good overall health. Some, not all, of the minerals we need are sodium, calcium, potassium, phosphorus, chlorine, magnesium, and sulfur. Why do we need them? They all play a role in maintaining good overall health. Where do you find them? Salt water may be boilded to produce sodium, or the eyes of the animals you kill will contain salt. Other minerals will be in the foods you eat and it should not be a problem as long as you eat a variety of foods. While all of this information may seem overwhelming to you, you are most likely getting most of these vitamins and other things during the course of a day. We are just not aware of what is in most of our meals. Those of us who take a good quality multi-vitamin daily are getting our requirements of both vitamins and minerals. When in the field, and forced to procure food, make sure any plants you harvest are known by you to be safe to eat. You may find almost any of the vegetables and fruits in the wild that are for purchase at your local market. Remember to wash them, but do not soak them in water (prolong soaking can reduce the vitamin content). I suggest boiling them in soups or stews to retain most of the vitamins that would otherwise be lost. While the idea of eating some of the foods survivors are at times forced to eat may be repulsive to some, what is the option? It has been less than 100 years since the link between foods and diseases has been identified to some degree. British biochemist Fredrick Hopkins, in 1906, proved in his studies the association between vitamins (though not called that yet) and the human body. He found a “missing link”. His research indicated that a body not only needed proteins, carbohydrates, minerals, water, and fats to develop, but it also needed what he called “accessory factors.” Further research by others has shown these “accessory factors” were in fact what we today call vitamins. Primitive man had no knowledge of vitamins, but his instincts were fairly good. Often, after the killing of a buffalo or large game, he would eat parts of the liver or other internal organs raw, almost immediately. I have read of explorers who did the same and they described a deep “animal like craving” for the bloody meal. Additionally, Native American ate most parts of the game they killed. Were they merely being thrifty with the game they killed or did the act serve some other unknown urge? I think this urge to eat most of killed game was a body’s need for life saving essential vitamins and minerals. If you are ever faced with a true life and death survival situation, remember this article. Keep in mind to constantly be looking for a variety of foods, thus a variety of vitamins and minerals. Eat plenty of green leafy plants (if you can safely identify the plant), gather eggs, nuts, pine needles and other sources of food. Set out fish traps. Consider eating the parts of an animal you would not usually consider a “prime cut.” Survival is not for the weak of heart. Those who do what ever is needed still have no assurance of survival. Nonetheless, the will to survive, continuous hard work, and constantly procuring sources of food can increase your chances of survival. Take care and I hope to see you in the field.